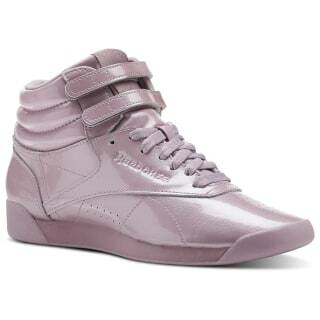 Channel your inner 80s vibes with these patent leather high tops. With their shimmery finish, they're the perfect shoe to play up or down any outfit. Lock in your throwback look with the ankle-strap closure. A full-grain leather vamp and toe create instant comfort. That comfort keeps on going with the lightweight EVA midsole and padded foam sockliner. The durable rubber outsole stands the test of time. Go on, step into these classics and hit rewind so you can play it again.